The first exhibit someone sees when they walk into the Museum of the Moving Image, in Astoria, New York, is a collection of animated gifs created by the Something Awful Forums. The exhibit, called “We Tripped El Hadji Diouf” takes animated gifs away from the context of a comedy forum thread and treats them instead as art. The museum setting instantly recontexualizes the animated gifs into something worthy of a highbrow appreciation. As a bonus, the museum also now exhibits animated gifs that were created as a reaction to the news of the original set of animated gifs being displayed. It’s an art-comedy Ouroboros. One of the most interesting things about the IndieCade East conference is that it takes place in that museum. I’m always fascinated by how the placement of video games in museum spaces changes their meaning and context. The Museum of the Moving Image is open for regular business during the run of the festival, and festival organizers work hard to make sure that there is enough space that not only can dedicated festival-goers see the event, but the regular public in New York City can see some of it too. As a result it provides a unique opportunity to watch people play indie video games in a public space. I played a lot of games at the show, but watching other people play games was more interesting. There’s an immediate division among the audience at IndieCade East. There are the enthusiasts: the people who are here specifically for the show. They’re a diverse crowd of adults but still majority male, with lots of beards, and easily recognizable in their con-going clothes. They have wristbands or lanyards so that they can access all parts of the show floor. Alongside them are public museum attendees, the people who maybe weren’t sure what they were getting into. I saw a lot of parents with kids at the event: perhaps making the assumption that, because it was a game thing, it was a for-kids thing. It both was and wasn’t. The “Indie Essentials: 25 Must-Play Video Games” exhibit is on the third floor and was accessible to those without a show badge. Being part of the museum’s current collection, it’s still accessible now. To those parents who did bring their kids, it might have been a shock to see something like Porpentine‘s Bloody Princess Farmer sitting on the floor here. 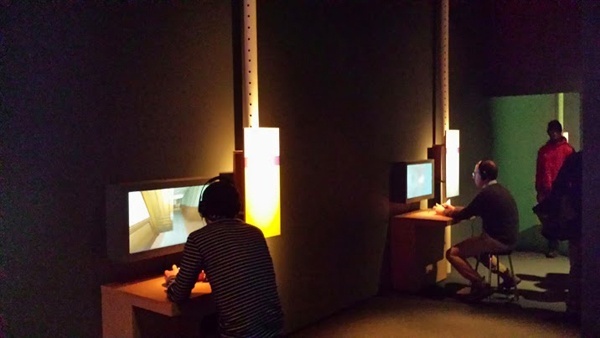 The Twine exhibit did have a warning label about harsh language, and the public games exhibit was otherwise cultivated so that no displays of graphic violence would be accidentally witnessed. So no Hotline Miami here, but a lot of the usual suspects such as Braid and Flower, as well as some less-obvious but quality games like Machinarium and N. There was a huge screen showing Minecraft, which most kids seemed to already be experts at. 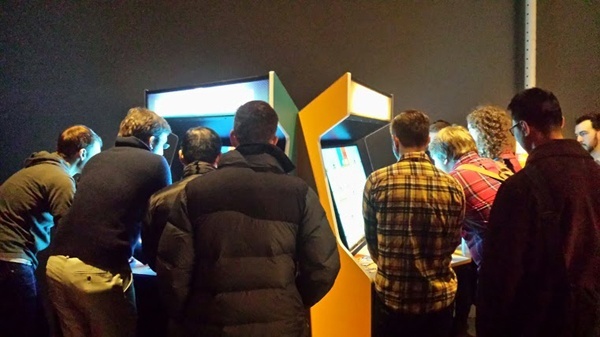 There was a big custom arcade machine set up for Killer Queen, which seemed to be tremendously popular. Here, I stood and watched people play Passage for a long time. I watched one brutal score attack where the player broke 900 points. The best strategy seems to be to leave the girl behind (obviously) and walk down and backward a lot, to be sure to cover the maximum amount of the game’s maze. I’m not sure what this actually says about the game-as-metaphor. The points supposedly don’t matter, but it’s logical to care about them in absence of much other stimulus. Another player who picked up the girl but was trying to get points was frustrated by the limitations she imposes. He was constantly just two pixels short of picking up a chest. After he had finished engaging with the game from start to finish, I piped up and asked him: So what did he think of this game, anyway? “I don’t see the point of it,” he said with a shrug. I felt a little vindicated. One of the festival’s official talks was called Super Panel Fighter, a tongue-in-cheek rapid-fire Q&A session. In this context, when asked the difference between Dear Esther and Gone Home, Zach Gage commented candidly that “Gone Home has stuff in it.” I was struck by that because, in the Essential Games exhibit, those two games are positioned right next to each other. It allows an observer a point of view to watch two different people interact with both games at the same time and really highlights both the similarities and differences. My early observation was that, in a comparison between Gone Home and Dear Esther, Gone Home is more immediately comprehensible to a non-gamer. The players of Gone Home got that they were supposed to be exploring the house, and the presence of small puzzles – a locker that requires a code – gave them short-term immediate goals to peruse to give some purpose to that exploration. A woman I watched playing Dear Esther seemed to understand that she needed to get to the lighthouse, but had no real idea how. The game’s goal is this single, long-term goal and it did not seem to make sense to her that the path was so indirect. I watched another patron try to help her extract her camera-self from a stubborn rock formation, but she eventually gave up out of frustration. I talked later to one New Yorker who said Dear Esther was his favorite game of the show. He appreciated its take on “natural beauty.” But then he said, idly, that he didn’t suppose games like this were anything he could just purchase to try at home. He seemed surprised when I told him if he just Googled the title, he could buy his own copy from the developer, and it didn’t require any special computer to run. Only then did it occur to me that not a single game on the floor included purchasing information that would be useful to a passer-by. Most of the games in the “Indie Essentials” collection were both commercially available and relatively cheap. Yet by contextualizing them as museum pieces, the games were no longer seen by at least one patron as something he could easily purchase and consume. I’d wager he wasn’t alone. The majority of people see games as goal-driven. “How do I win this?” isn’t necessarily a stupid question. Though there’s been a lot of debate in the more insular games community about what can and can’t qualify as a game, on some level, “Notgames,” like the ones made by Tale of Tales, exist as reactions to “regular” games. They require a special literacy: a context of what the default expected interaction is is initially necessary to understand what’s new about the interaction the new form provides and what interactions it does not provide. 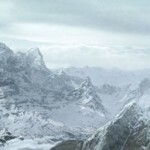 Here, The Path, where an avatar is visible onscreen, perhaps fared better than Dear Esther did. However, I never saw anyone engage with The Path for a very long time, which I attribute to its legendarily slow pace. The Museum held a Nidhogg tournament on the second floor on Sunday. It’s a highly spectactable game: the purpose is territory control and the action is clearly comprehensible. It’s sort of violent compared to most of the show, but the gore is so abstracted in bright pixels that it’s hard to read as actual blood splatter. Between rounds, the tournament holders rebooted the game. “What’s that interface that they’re using?” asked a man next to me, with his son riding piggy-back on his shoulders. “It’s called Steam,” I said, not sure of his level of expertise. Turns out he knew Steam, but hadn’t seen it in a while and it looked different from how he remembered. He works in IT, but the needs of parenthood and the dayjob kept him too busy to enjoy much PC gaming. “It’s nice that this is here,” he said, “instead of in some warehouse or something.” Bang on. An event like PAX is for “gamers.” In the earlier years of the expo it was still possible to wander into it on accident, but now it takes a pretty dedicated effort to even get a pass in the first place. Non-“gamers” stay away. It’s a challenge sometimes to grow the audience, to show people new games that they might find interesting if only they knew they existed. A public event like IndieCade East is a great way to bridge that gap. We can do more. And as developers and fans, we all benefit from seeing this kind of reaction to the works, taking a step back and looking at games in a new context. Great piece, AJ. I’ve never been to IndieCade and the setting seems like an amazing place to learn about much more than games. Your remark on pricing and availability really made me think. You’re right, of course – walk into a museum and you assume you’re looking at stuff created for the museum, and if it’s available at all (like as a print of an original painting) it might be expensive. They really should put cards next to everything with instructions on how to get copies (and, frankly, sell them in the museum shop). This kind of thing builds bridges that other events like PAX aren’t meant to build. Good on it. I can certainly understand that reaction – thinking these games are special one-offs for display. It’s interesting, I do still encounter people who, relatively unfamiliar with modern gaming beyond a vague awareness of what Xbox is, regard games as split between lesser “home versions” and more impressive location-based things that you have to go to an arcade or a theme park or something to experience. I think it’s easy for us to take for granted that familiarity with the landscape, especially since it’s not a new phenomenon: in the US, at least, arcades were pretty well dead by the mid-1990s. Home consoles and computers had at least caught up with them technologically, and outpaced them in many ways. How well did people engage with some of these experiences, or how fulfilled did they feel coming away from them? I’d wonder at how much you can get out of a game experience in a museum setting in some cases when there’s not a practical way to finish it there. Passage obviously works because it’s brief; something like Dear Esther works because it’s aesthetics are striking and no one wants to actually sit through the whole thing anyway. But something like Gone Home I feel would lose a lot in the translation: brief interactions might be enough to intrigue, to send those who realize they can buy it for themselves home and to Steam or something, but so much of that game is exploration, is finding the story unfolding before you. It seemed to me like people were totally okay with engaging with Gone Home in small chunks. I’m sure they didn’t get the entire scope of the narrative, but that’s not really important when what you’re checking out might be individual diary entries or just a few locations in the house. A house is an easy to understand space. I didn’t specifically ask anyone what they thought of Gone Home admittedly; I was just observing based on what they decided to do that most people seemed to at least think it was neat.